Emerge from Russell Square tube station, step across the road into Marchmont Street, walk along it for about three minutes and on your left you'll come to The Marquis Cornwallis pub. The pub, one of many pleasant boozers located in London's Bloomsbury district, has had a makeover in recent years and makes for a convenient stop-off before or after exploring the also-recently-renovated Brunswick Centre directly across the street. The Marquis of Cornwallis is spread over two levels and can get pretty lively on Friday evenings with local workers dropping in on the way home from work. On balmy summer nights many drinkers choose to sup their pints on the street just outside the pub, and with the establishment being on a quiet corner, there's plenty of space in which to do so. There are even a few tables and chairs outside too, so you can rest your legs if you like. Whether you're a beer drinker, prefer a glass of wine or simply something soft, this pub'll have you covered. British cask ales are served at The Marquis Cornwallis, as are Czech pilsners, German lagers and American craft beers. Of course, you'll find spirits and ciders here too. Enter the establishment with an empty stomach and you may have a problem on your hands - the problem being, what exactly to choose to eat from the pub's extensive menu. Sandwiches include roasted red pepper and grilled haloumi, served with root crisps for £5.50, and handmade fish fingers in a glazed bap with tartare, served with root crisps for £5.25. If you're looking for something more substantial, you might want to consider the beer battered haddock and chips with minted crushed peas and tartare for £9.75, or the Shropshire roast chicken with herb butter, fries and red wine gravy for £11. There's a decent looking brunch menu too, and on Sundays - as you'd expect of any decent British boozer - you can grab Sunday lunch (for around £11). 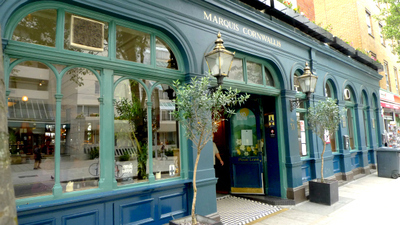 Located in a mainly quiet area a ten-minute walk from bustling Euston and King's Cross, the Marquis Cornwallis is worth seeking out if you'd like a drink away from the crowds of commuters and noisy traffic. Why? Great location - lots to see and do in the area.